Does Your Team Have the Right Skills to Deploy Predictive Marketing? Predictive analytics skills are in great demand. 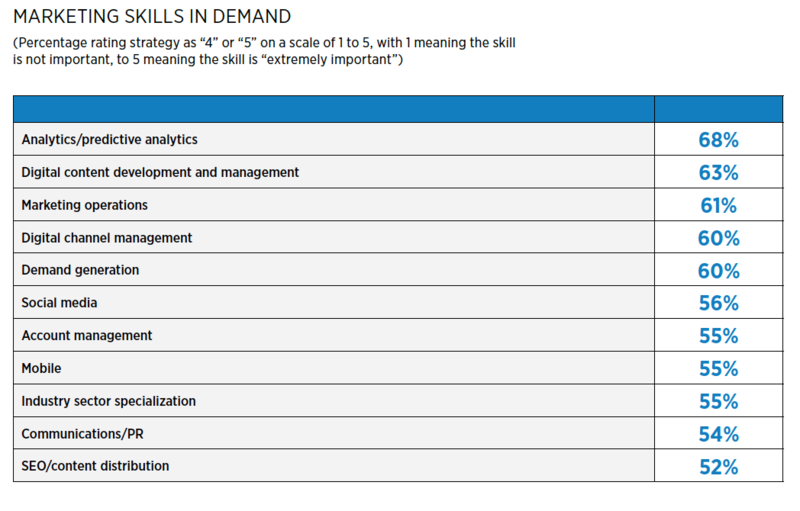 In terms of skills sought, analytics/predictive analytics are in high demand at more than two-thirds of organizations. The key to successful predictive marketing is the ability to pull together many parts of the enterprise. Ultimately, predictive marketing extends well beyond the marketing department—information moves both upstream and downstream, providing guidance not only to top-level executives, but also to production, procurement and sales departments, as well as supply chain partners and vendors. This calls for not only technical and data analysis skills, but also business communications to help all parts of the enterprise participate in and benefit from a predictive marketing strategy. The rise of predictive marketing means a growing integration between marketing executives and technology specialists. Marketing teams need to better understand the implications of data science and move their organizations toward competing on analytics. This calls for more analysis tools and skills. Organizations that develop and leverage these capabilities and embed them into their full range of marketing activities will have the advantage in their markets. Organizations need highly skilled professionals, versed in everything from data science to content development, to make their analytics efforts work. A majority of organizations have rolled out internal training programs that will help develop such skills. Executives report there is an intense need for the skills that can deliver predictive marketing capabilities. Another 61% say basic marketing operations skills are the most valuable commodity. Organizations are undertaking a variety of training and support approaches to build their analytics and predictive marketing skills bases. There is wide adoption of on-site training and education for employees, as well as informal but ongoing approaches such as coaching and mentoring. In terms of predictive marketing maturity, those organizations that are early in the process are just as likely as their more advanced counterparts to be encouraging and supporting ongoing training and education. Organizations still in the early stages of their predictive marketing efforts recognize even in these early stages that employee training in new techniques is essential. Get your full copy of The Predictive Journey here.